The Oz-like Burj Khalifa in Dubai officially opened today, succeeding Taipei 101 as the world’s tallest building. There is no disputing its preposterous height: At 169 stories, or 2,717 feet, the $1.5 billion tower on the edge of Dubai’s business district stands a little more than half a mile high, roughly twice the height of the late World Trade Center twin towers. But not everyone agrees that it qualifies as the tallest manmade structure. And suppose it does? Given how egregiously the Dubai boom has cratered, it’s hard not to think of the building as a monument to the false economies of the 2000s. Countries on the verge of economic ascendancy can be relied on to build the tallest structure in the world as an expression of their ambition. It was true of America when the Empire State Building topped out in 1931, as it was Kuala Lumpur in the late 1990s and Taiwan in the mid-2000s. It was almost inevitable that the Middle East would steal the crown. The problem, of course, is that over the past six months Dubai has become the poster child of the maligned borrow-and-build approach to prosperity. Shares of Emaar Properties, the tower’s developer, have dropped 86% since Dubai real estate peaked five years ago. The structure had previously been known as Burj Dubai, but at the ribbon cutting ceremony held this morning it was officially renamed Burj Khalifa in honor of Sheik Khalifa bin Zayed Al Nahyan, the ruler of Abu Dhabi, which has repeatedly bailed out Dubai during its financial meltdown. As Christopher Hawthorne pointed out in the Los Angeles Times, 90% of the tower’s 1,044 condo apartments have been sold, but most were bought as investments and will likely go unoccupied for the time being. The first residents are supposed to move in later this month, but the real-estate crash may cause a good number of buyers to abandon their deals. Nor will there be much demand for the thirty-seven floors set aside for offices. Burj Khalifa may be a shining spiral edifice on the outside, but it’s interiors will be 3.7 million square feet of emptiness, a vertical ghost town. It’s the architectural equivalent of Pamela Anderson’s breasts or Goldie Hawn’s surgically plumped lips–a puffed up esthetic for an era of disingenuous. 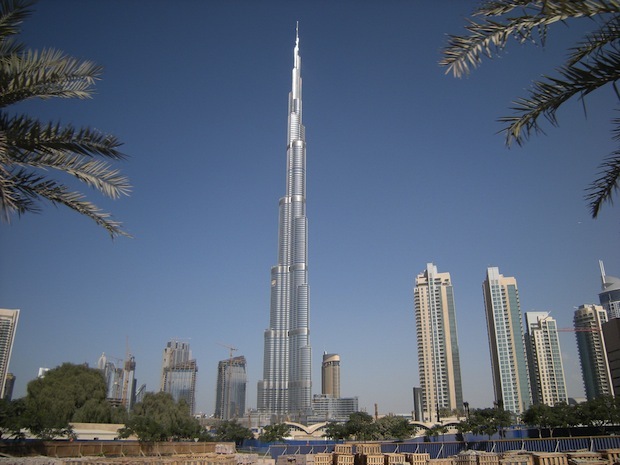 With today’s ribbon cutting Burj Khalifa, which was designed by the Chicago office of Skidmore, Owings & Merrill, officially became the tallest building. However, it may not be the tallest structure, depending on the type of measurement. 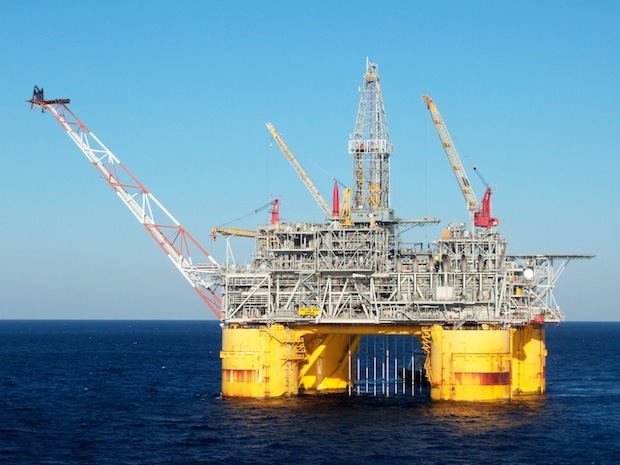 The Ursa tension leg platform (pictured above), an oil production facility 130 miles southeast of New Orleans owned by Shell Oil, has a total height of 4,285 feet from the sea floor. However, the Council on Tall Buildings and Urban Habitat, an obscure coterie of engineers that presides over height statistics, does not consider an oil platform a building because it extends underwater, has minimal habitation and supports itself with tethers. So for now, Dubai holds the record, however dubious it may seem.